I saw this cutie a few days ago while walking by the lake. 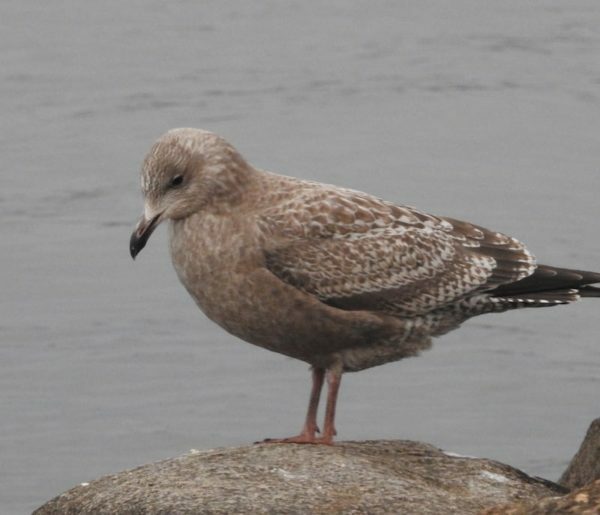 It’s younger than the previous juvenile ring-billed gull I wrote about. I deduced this from its beak, which is mostly black instead of featuring the black ring for which ring-billed gulls get their name, and from the all-over mottling. 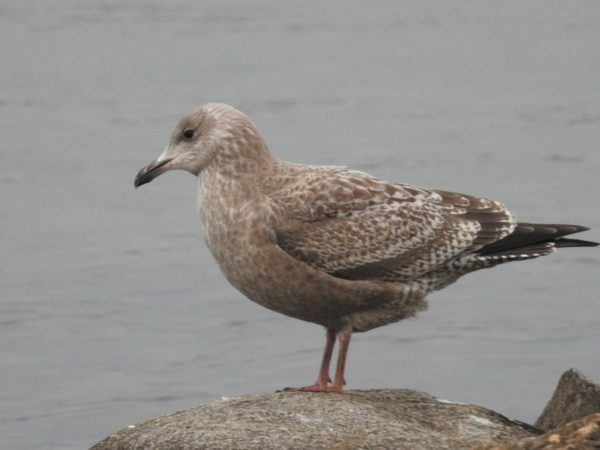 Older juveniles have a mix of mottling with some solid gray on the wing feathers, and fully grown adults are mostly solid white and solid gray with mottling only around the head and neck, and only in winter. I like how thoughtful it looks in the second photo. What does it see? If I remember correctly, it saw a duck who kept tipping forward for food so that only its rear end and hind legs stood out of the water. Here is another one around the same age, but bearing a later stage of plumage. I took these photos on the same day as the photos above. You can tell the gull on the rock and the one in the background are first-year juveniles because of their beaks. While they have more yellow in their beaks than the gull at the top of the post, the tips have the appearance of being dipped in ink. 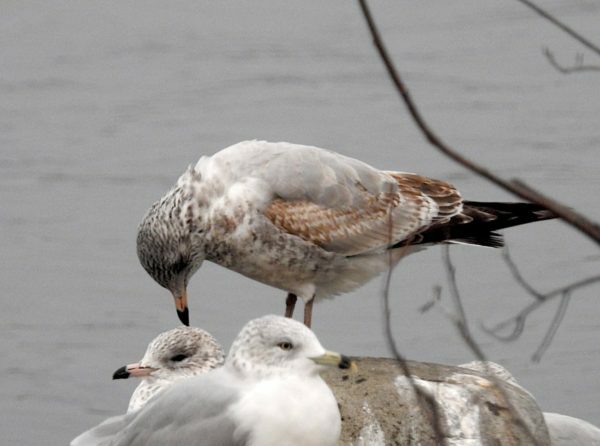 Around reaching one year of age, ring-billed gulls develop a clearly demarcated black ring that separates the yellow area on the bill’s tip from the yellow area on the beak’s hind end. I like this picture because it looks like the bird at top is booping the other on the head. It’s a trick of the camera, but it’s funny anyway, especially since the “recipient” looks so nonplussed. 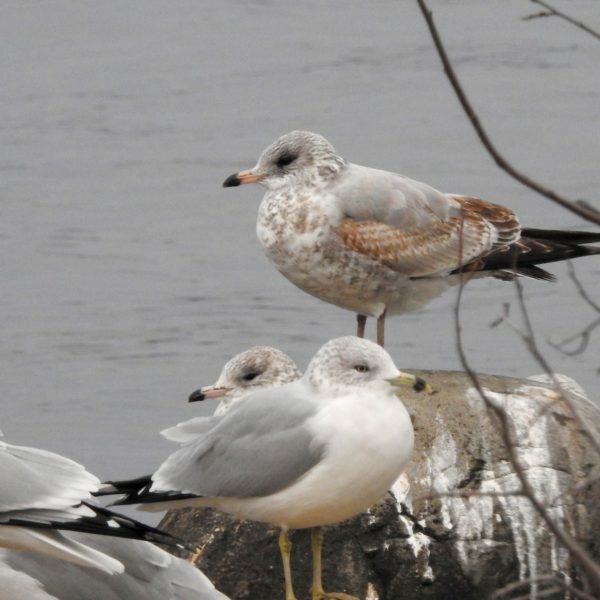 Read more about ring-billed gulls (Larus delawarensis).